A scalable AV setting results in significant cost savings when future-proofing board rooms, conference rooms, or any enterprise environment. The rise of AV over IP in the IT and audiovisual industry is clearly recognized by Key Digital. Enterprise AV over IP offers organizations a solution to increase efficiencies and cut overhead costs the larger they grow. On a new episode of BZB Express TV, our team installs and demo the Enterprise AV over IP system. As a matter of fact, you can watch the video below. The prowess and performance of the Enterprise AV platform provide a secure and scalable AV environment. Let’s get a first-hand look at the complete Enterprise AV over IP line by Key Digital. 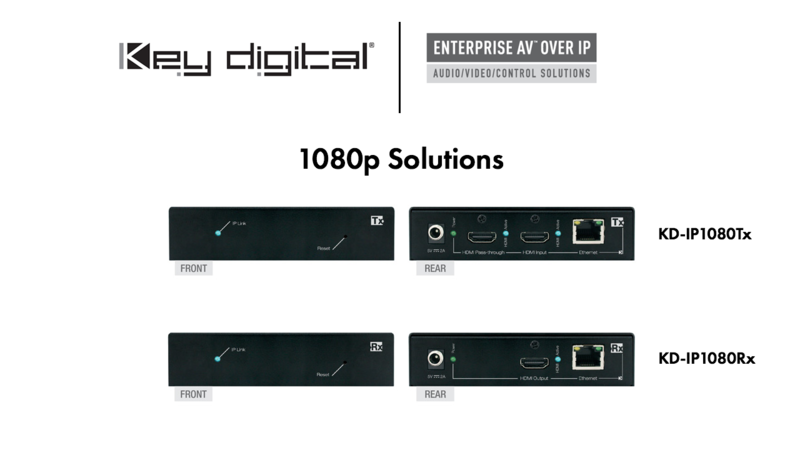 Enterprise AV over IP by Key Digital offers excellent flexibility to pro AV system integrators. It’s also a versatile platform for a variety of uses and markets. Starting with their 1080p Enterprise AV over IP products are the KD-IP1080Tx encoder and KD-IP1080Rx decoder. Utilizing H.264 compression, the KD-IP1080TX/Rx is ideal for large video distribution applications as a point-to-point or can be connected through a network IP switch. Adding a network IP switch to the KD-IP1080TX/Rx creates a variety of modes. Users will be able to build a video distribution, matrix switching, extension, and IP control expansion systems. Furthermore, customizing an AV over IP system is as simple as adding an encoder/decoder to expand up to 1024 encoders to an unlimited amount of decoder units. Additionally, the platform offers a distribution of control signals to create fully integrated and controllable networked systems. The 1080p Enterprise AV over IP line is perfect for large enterprise installations to mid-to-large size residential projects. 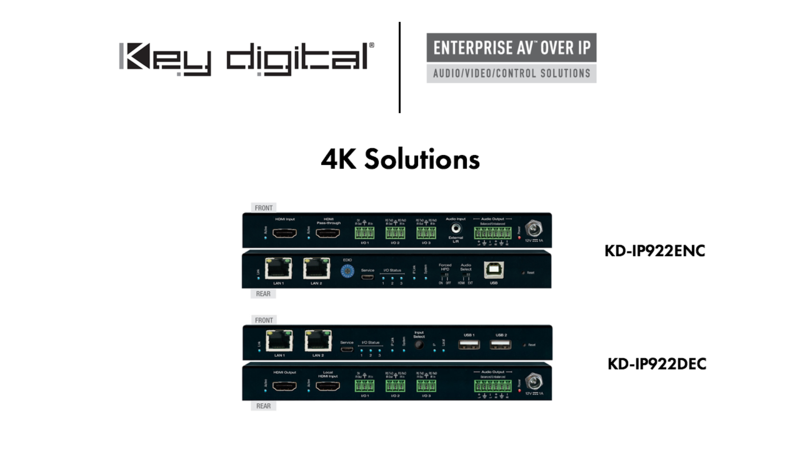 Key Digital’s 4K Enterprise AV over IP Encoder (KD-IP922ENC) and Decoder (KD-IP922DEC) create expandable AV over IP systems that can be scaled for any home or commercial installation. The KD-IP922ENC and KD-IP922DEC can be set up as a primary point-to-point system. Add on a gigabit network switch, and users open a realm of possibilities including video distribution, matrix switching, video wall, extension, and KVM matrixing. The KD-IP922ENC and KD-IP922DEC support 4K/UHD resolutions with the ability to down-convert incoming 4K to 1080p or 720p at each decoder. Moreover, 4K signal extension covers up to 330ft into network switch or point-to-point setups. Additionally, the systems can create video walls with up to 8 vertical and 8 horizontal screens. Also, when integrated with a compatible PoE (power-over-Ethernet) network switch, a power supply is not necessary for the devices. The encoder has two USB ports and a single USB port on the decoder for KVM extension. In regards to audio, multi-channel including DTS:X and Dolby ATMOS are available. With audio DSP, controlling volume, muting, 3-band EQ, and lip-sync delay is manageable on the audio de-embedding port. The 4K Enterprise AV over IP platform is perfect for large digital signage environments, retail spaces, or corporate networks. Any commercial application that requires a reliable platform with expansion capabilities is ideal for Enterprise AV. The Enterprise AV over IP system can be integrated with their Key Digital Management Software (KDMS Pro) to configure units, build virtual matrix systems, add video walls, and manage video routing. 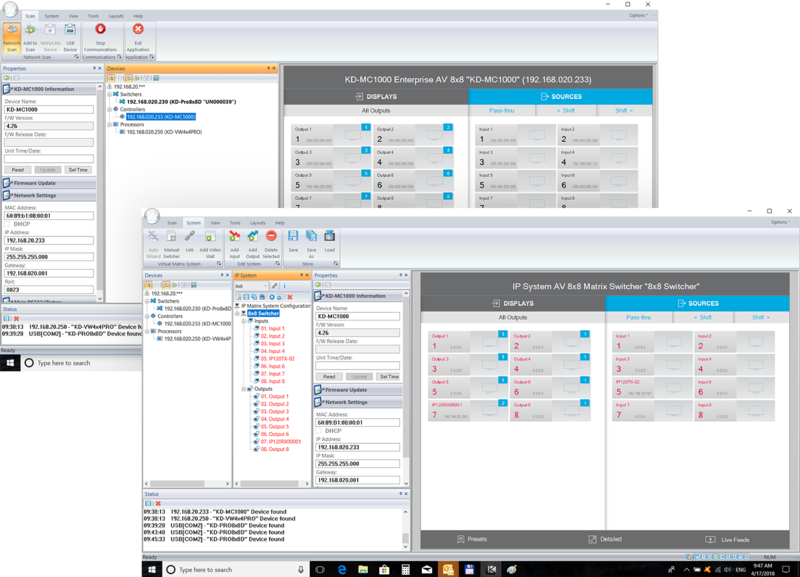 The KDMS Pro is a a great tool for professional AV integrators and users to assist with configuring devices, audio and video routing, network settings, firmware updates, video walls and more. The software works great for setting up the Enterprise AV system and managing each encoder/ decoder. 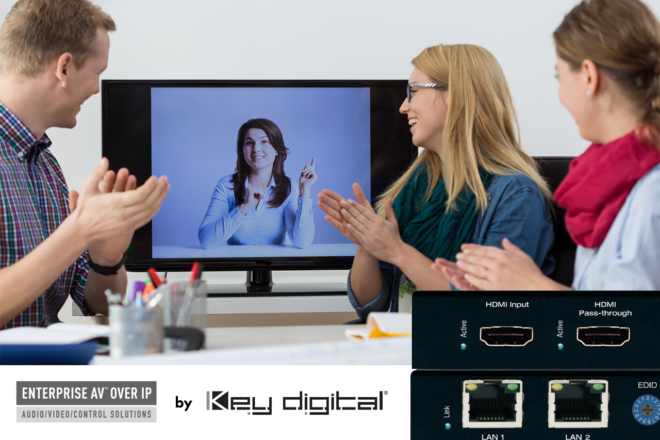 The ability to build a virtual matrix, create video walls, add devices, and manage AV routing is made simple with the KDMS Pro. The KD-APP is an easy to use platform for the Enterprise AV over IP system. All current products with IP control ability are suitable for KD-APP. The application enables users to manage full switching and define presets of their usage along with their multiviewers, video walls, and presentation switches. Currently, the KD-APP supports only Apple devices such as iPads and iPhones. Users can directly download the KD-APP at an iOS App store and it will auto scan any active Key Digital devices on your network. The KD-APP is ideal for the Enterprise AV over IP platform for anyone looking for the most basic control of their system. Compass Control Pro is a fully integrated iOS-based control system. With pre-built templates and a bi-directional module library, Compass Control Pro is a plug-and-play solution. Complete control and signal management under one brand, especially when working with multiple brand subsystems. Compass Control Pro is fully customizable and made to work for you, on your device choice, and your system’s specifications. It’s innovative and flexible, scalable to any size business or government organization. All delivered in an elegant, user-friendly interface. There’s a lot to like about the Key Digital Enterprise AV over IP platform. The system is capable of an 8×8 video wall, perfect for digital signage and large retail spaces. The encoder has an HDMI pass through while the decoder includes a local HDMI input for local sources near the display. This is helpful, especially if you have a local source like a Blu ray player that you want to plug into the system instantly. Furthermore, it has a nifty input select button which will allow the user to toggle the connected source devices. Other features include multi-channel audio such as DTS:X and Dolby ATMOS, ideal for surround sound systems. Also, the encoders have two USB 2.0 Type-A and a single Type-B USB port on the decoder for KVM extensions. Lastly, the Enterprise AV over IP system has one of the most extensive lists of certified network switches, a major plus. The Enterprise AV over IP system requires a USB-C cable and network cable to connect and configure simultaneously. Not too big of a deal, but we recommend using a longer USB C-Type cable in case the coders are in a rack or a small space since computers aren’t typically located at the rack. Lastly, the Compass Control Pro only supports Apple devices. We’re sure Key Digital will address this and hopefully support Android devices soon. Enterprise AV by Key Digital enables companies to grow and effectively cut cost with their ultra scalable AV over IP platform. Tasteful homeowners can also implement this technology towards a future-proof smart home. Enterprise AV over IP systems are infinitely scalable and can be easily installed in currently existing network structures. Key Digital’s Enterprise AV is presently available in the BZB Express catalog.